To be honest, as I write this I am not exactly sure I will post it. My goal this year was to only post Christmas Tips during the month of December. It has taken something pretty important (at least to me) to make me stray from my plan. Last night I was heartbroken as I read that The Disney Company has decided to remove Walt's name from the Picture Division. Instead of Walt Disney Pictures it will now be known simply as Disney. 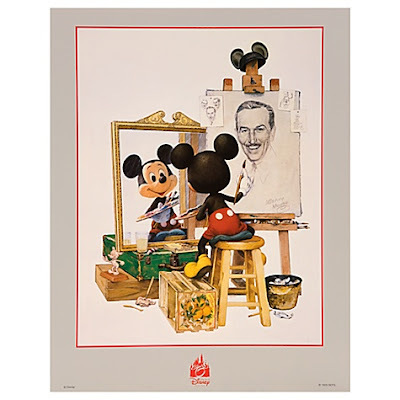 Granted the logo is still that of Walt's famous signature, but don't we need to remember "...it all started with a mouse" that WALT created?? Really isn't Mickey an extension of Walt, and viceversa? That being said, as I read on Jim Hill Media, we do live in a world where it is important to have a presence in cyberspace, especially one that is compatable with smart phones. Shortening the logo so that you can read it when you view a movie trailer on your phone is understandable. Another thing to remember is that Walt's presence is alive and well at the theme parks, Walt's statue hand in hand with Mickey is almost as famous as Cinderella Castle. I really don't see them removing Walt's name from Walt Disney World, which coincidentally would have just been Disney World had Roy not changed it after the passing of Walt. So with a much clearer head this morning I realized, it's up to all of us - the true Disney Fans - to keep Walt's Memory alive. We need to tell our children about the man who created Mickey Mouse, and his brother Roy - who was his right hand man. We need to blog about the founder of The Disney Company and support the Walt Disney Family Museum. We need to visit Walt Disney: One Man's Dream during our trips to Walt Disney World - here is a great post from my friend Kelly at Disney Guru about this attraction you should really read. It is up to us to keep Walt in Disney, and to keep his dream, and legacy alive. I promise to do my part, I hope all of you will too. Donna Kay I could not agree more! Thank you so much for sharing my post and for writing about Walt. He woudl be proud of you. Hugs! Thanks Kelly! I wish he had lived to be 100, can you imagine the things he would have done! !